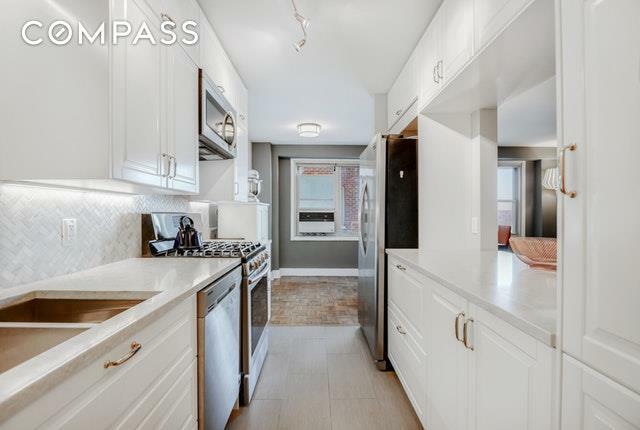 Newly renovated high-floor Jr-4 with beautiful open Hudson river views at Cabrini Terrace, the premier doorman co-op in Hudson Heights. 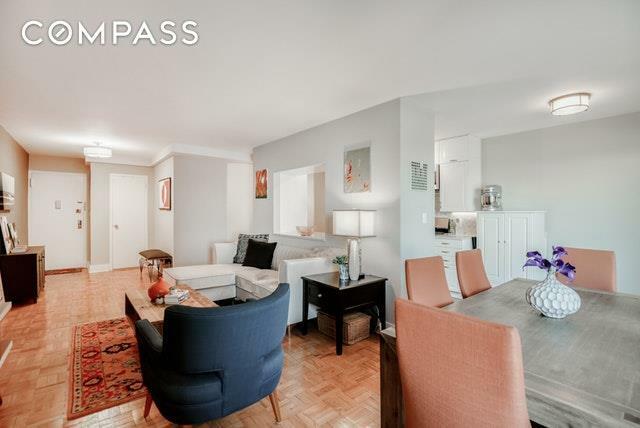 This over-sized one-bedroom home offers gracious open-plan living, a beautifully renovated kitchen and bath, and a king-sized master bedroom all with open Northern and Western views of the Hudson River and wooded Palisades beyond. From the entry foyer, a large living area extends 21+ feet, ending in a windowed dining area that can easily accommodate an 8-person dining table, or be converted to create a perfectly-sized home office. The newly renovated kitchen has been completely re-configured with custom cabinetry to maximize space and storage, and offers new white-quartz counters, stainless steel appliance suite including Samsung dishwasher, gas stove and oven, built-in microwave, and a double-door Fridgidaire refrigerator. 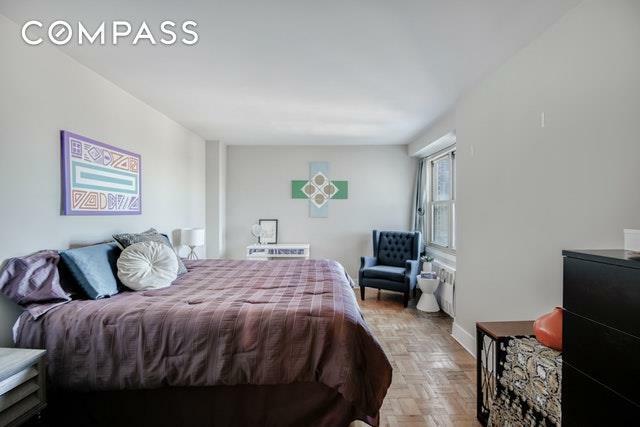 The unit also offers exceptional storage space throughout, with four large closets, including two walk-ins. The king-sized master bedroom easily accommodates an entire set of bedroom furniture, along with a home office or sitting area, and offers stunning northern views up the Hudson River to the Tappan Zee Bridge.Cabrini Terrace is a full-service, environmentally progressive cooperative with 24-hour doorman service, an attended garage (inc. Zipcar on site), community room, central laundry, bike room, two elevators, a resident super. In addition to low maintenance, Co--gen project and solar panels translate to low energy bills. Surrounded by beautifully maintained gardens, lawns and trees, the building is situated in the heart of Washington (Hudson) Heights -- one block from Fort Tryon Park, home of the Cloisters Museum, the gorgeous Heather Gardens, and countless walking paths and running trails. Hudson Heights also offers numerous boutique shops and restaurants, including Uptown Garrison, 181 Cabrini, Saggio's, and the upcoming highly-anticipated North End Food Hall, which many feel will transform the retail landscape of the area. 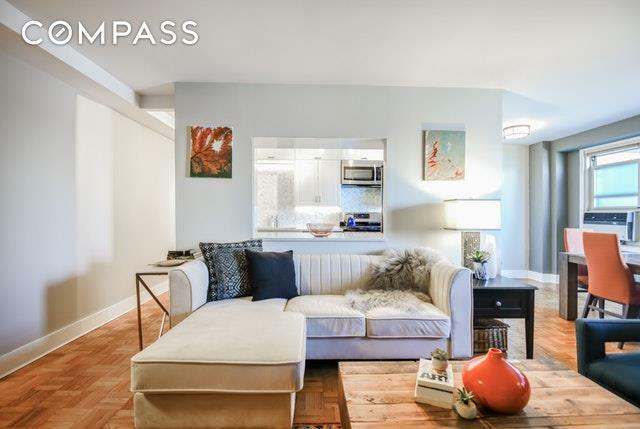 Set high above the Hudson, with park-like grounds and spectacular views, Cabrini Terrace still offers an easy 20-minute commute to Midtown Manhattan on the A-Express at 190th Street. The 1 Train, along with numerous bus lines, are also easily accessible at 181st Street. Cats are welcome, but dogs are not permitted. Listing courtesy of Isil Yildiz of Compass.